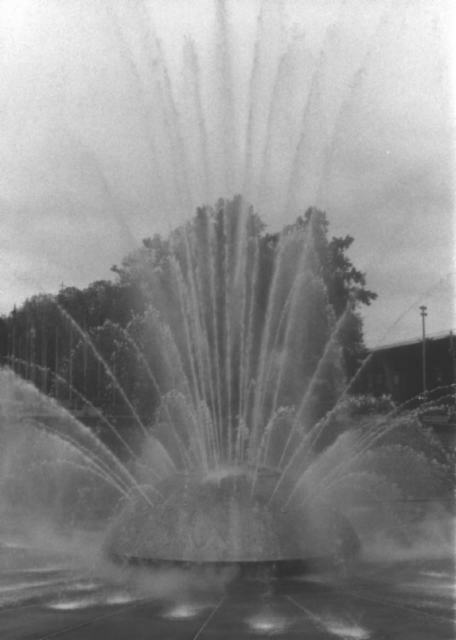 The International Fountain was constructed in 1961-62 for the Seattle World’s Fair Century 21 Exposition on the site of Mercer Playground. After acquiring the property in 1900, the City transferred it to the jurisdiction of the Parks Department ten years later. The site was developed into a playground and named for Seattle pioneer Thomas Mercer, who homesteaded in the vicinity. Covering an entire city block, Mercer Playground served both the surrounding neighborhood and the 1902 Warren Avenue School located across the street to the west. In the mid-1950s, the decision to locate the fair adjacent to the Civic Auditorium was made, in part, due to the fact that the playground site could be easily included in a proposed 74-acre site. In order to connect the fair’s five worlds, the original plans called for "The Boulevards of the World," a pattern of streets and avenues lined with colorful shops, bazaars, and restaurants. An open mall at the center would allow visitors to enjoy a panoramic view of the entire Exposition. The mall’s primary feature would be a long narrow lagoon snaking from north to south and crossed by a bridge at the midpoint. It was envisioned that Venetian-style gondolas could ply the waters of this lagoon. 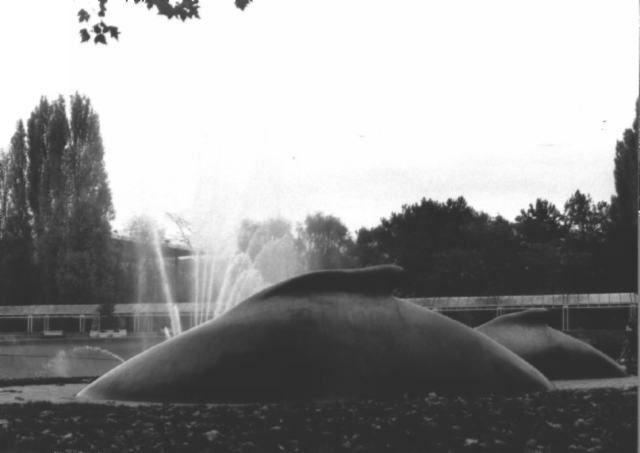 By spring of 1960, the lagoon idea had been replaced by a plan to hold a $250,000 international design competition for a "light, water and sculpture display" sponsored and paid for by the City of Seattle. Two young Japanese architects, Kazuyuki Matsushita and Hideki Shimizu, won the competition with a design for a monumental fountain that was to be the Fair’s centerpiece. The fountain symbolized mankind’s efforts to explore the farthest reaches of outer space. John O. Phillips & Associate and Harry B. Rich served as resident architects. In their design for the sunflower-shaped fountain, Matsushita and Shimizu wanted to put sole stress on the water itself, both its shape and its movement, without any extraneous sculpture or accessories. They did not see the need for outdoor lamps as sunlight would pass through the jets of water in the daylight, and floodlights set in the basin around the fountain at the center would illuminate the water at night. During the fair, the International Fountain, with its music, lights and 117 water nozzles, was the center of activity, especially during the daily water concerts and at night where it was a popular place to congregate. Children loved to run around the basin’s sloping walls of exposed aggregate, which also provided easy access for play in the fountain’s water. After the conclusion of the fair, the fountain retained its original form until 1995 when it was completely renovated. In an effort to preserve one of the city’s icons, the City of Seattle awarded the commission to rejuvenate the fountain to WET Design of Universal City, California. Working in collaboration with architecture and structural engineering firm TRA and landscape firm Nakano/Dennis, WET Design also increased accessibility, safety and the "showmanship" of the water display. 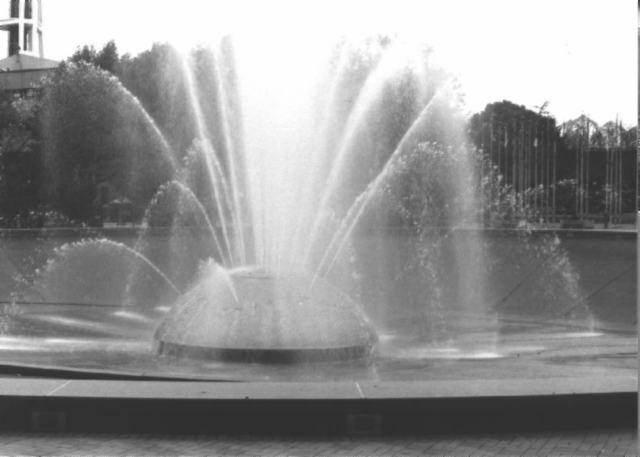 The fountain was reenergized and rededicated on October 28 1995. Although the renovations resulted in substantial alterations to its appearance, the fountain retains the basic form, character, and intent of its original design. The International Fountain is significant for its design and for its association with the Seattle World’s Fair Century 21 Exposition. 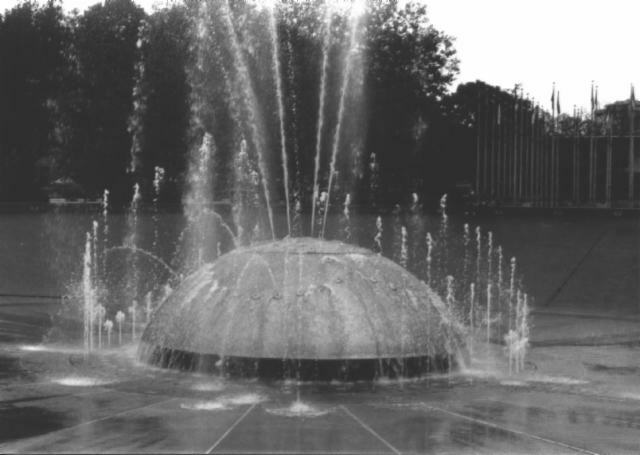 Completed in 1962, this large fountain is the centerpiece of an open mall at the heart of the Seattle Center. The block square site would have been bounded by Republican and Harrison Streets and 2nd and 3rd Avenues North. The original design of Japanese architects Kazuyuki Matsushita and Hideki Shimizu featured a reinforced concrete basin, measuring 185 feet in diameter. The basin’s sloping exposed aggregate walls were scored in a radial direction. At the center of the basin, a dome, 6 feet high and 30 feet wide, protruded through the white quartz stone floor. Dark amber glass in a mosaic pattern covered the dome fitted with 465 water jet nozzles, 117 of which were activated. This gave the fountain a sunflower appearance. Floodlights were set in two concentric rings in the floor around the fountain at the center in order to illuminate the sprays of water at night. After the fountain was completely renovated in the mid-1990s, the original appearance was substantially altered. The design team of WET Design, TRA and Nakano/Dennis retained the diameter of the original basin but reconfigured and resurfaced the interior. A low concrete wall capped with granite surrounds the basin and has an opening at the north end with ramps leading down to a circular plaza at the fountain level. A low pink granite curb lines the inner edges of the ramps, which are wheelchair accessible. The basin’s interior walls slope down steeply to the circular plaza, which is approximately the same size as the floor of the original basin. Located in the same center position, a new fountain in the form of a giant stainless steel metallic dome replaced the original sunflower dome fountain. Set in pink granite paving, rings of pulsing water jets and lights surround the dome. Sections of concrete radiate outward from the fountain within the circular plaza. Outside the basin, concrete pavers line a walk enclosed by a low concrete wall with a grassy lawn beyond. Gloria Bornstein’s cast bronze whale sculptures entitled "Neototems" occupy a site at the southwest corner of the grassy mall. Although the new design retains the basic form, character, and intent of the original fountain, little physical integrity remains extant. Century 21 Exposition, Inc. Century 21 Exposition. Seattle, WA: Acme Publications Incorporated, c1962.